Latest Happenings (Last updated on March 29, 2010)! * March 2010 Eli started the 2010 show season in Ocala, Florida by winning his class at second level test 4. Way to go Eli and his new rider, Janne. * Look for Eli and Tara in the 2008 Horse Classics Calendar. * The Lady Hawk Farm Stallion video will be available soon!!! * Our mare, Izzy, is pregnant for the last time. She is in foal to our stallion, Eli. If you are looking for a Friesian that has the sweetest personality, is sensible and levelheaded and has 3 very comfortable gaits, look no further. 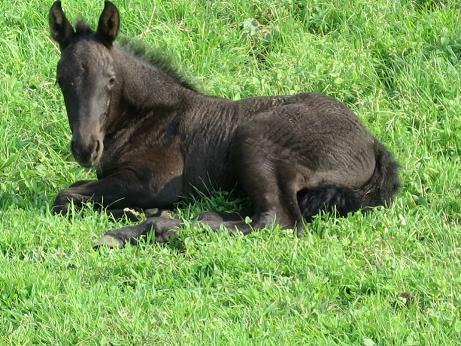 This foal is for you. Izzy has passed on these traits to all of her children and this foal will be no different. We are taking "in utero" contracts. Our last foal was sold the day it was born! * AT THE BEGINNING OF 2007, MY GOOD FRIEND AND TRAINER, TARA CELENTANO HAD A TRAGIC HORSE RELATED ACCIDENT WHICH HAS LEFT HER PARALYZED. SHE IS FIGHTING HARD TO REGAIN THE USE OF HER HANDS AND LEGS SO SHE CAN ONCE AGAIN DO WHAT SHE LOVES TO DO, TO RIDE. HER DEDICATION AND DRIVE TO “GET WELL” IS TRULY AMAZING ESPECIALLY WHEN SHE IS ALSO DEALING WITH SO MUCH PAIN, FRUSTRATION AND DEPRESSION. TARA IS ALREADY BACK TO WORK TRAINING STUDENTS TO RIDE HER HORSES AND HOPEFULLY SHOW THEM UNTIL THE TIME WHEN SHE CAN DO IT HERSELF AGAIN AND SHE IS ONE DETERMINED LADY!!!!! PLEASE SEND TARA YOUR PRAYERS AND WISHES FOR A FULL RECOVERY. 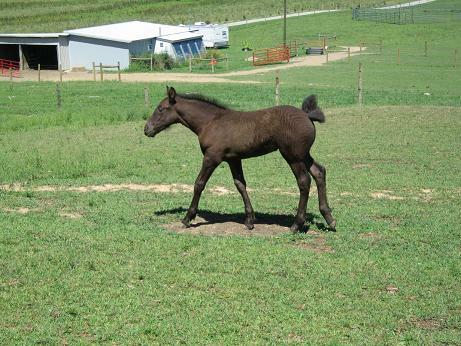 * Navarre's first daughter, Dixie's Jazz, was born in July, 2006. Her mother is a Belgian mare. Jazz looks alot like her dad when he was born, with dark curly hair, fuzzy tail and cute pointy ears. Her owners tell me that she is such a sweet girl and they love her very much! * Look for our stallion Ullysses in the 2006 Horse Classics Calendar. Navarre and Eli competed at the USDF Region 1 BLM Championship Show and did terrific! Lady Hawk Farm "stole the show" at the 2005 FPZV/FHS judging hosted by Aalsmeer Farm located in Milford,NJ. Our stallion Ullysses was awarded "star" status and our mare, Zeanna, passed her ridden Mare Performance Test completing the requirements for "star" mare. Our foal, Arielle, a daughter of Jorrit from Proud Meadows received a score of 8.0 and 1st premie AND was Site Champion. To make the day even more unforgetable, the judges keured our stallion, Eli, and recommended him for the Stallion Performance Test held in Jan 2006 at Proud Meadows, TX. * On May 5th, 2005, our mare Christina, gave birth to the cutest filly. We are calling her "Princess Arielle". Her father is Jorrit of Proud Meadows. We will have pictures of our little Princess shortly. * Navarre was named 2004 Champion for the American Warmblood Society for USDF Region 1 dressage. * On December 10, 2004 Lady Hawk Farm "Ladies" win National Awards in the German Friesian Horse Society judging tour. Our mare, Zeanna, was 2004 National Reserve Champion Junior Mare and her daughter, Marijka, was National Reserve Champion Filly. Congrats to both ladies on a job well done! 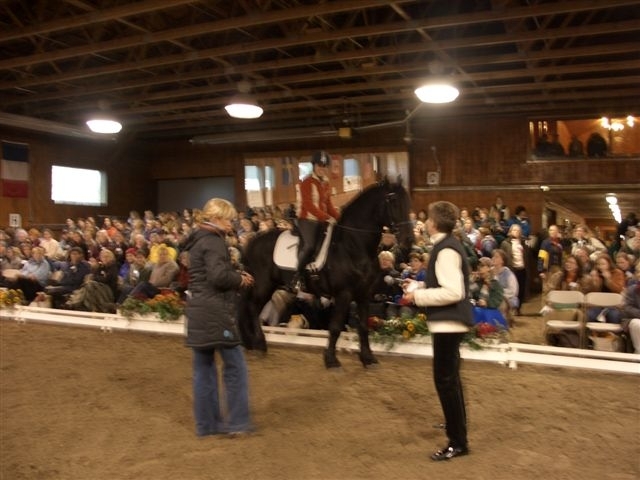 * On November 3, 2004 the German Friesian Horse Society keuring was held in Lenhartsville,PA. The Lady Hawk Farm Friesians did very well. Our filly, Marijka, was awarded the highest rank of 1st Premie with scores of 8.0 on her conformation and movement. She was also the Site Champion for the judging. Her mother, Zeanna, was given a 2nd Premie and made a Provisional Star Mare and must perform a ridden and driving test next year. Jorrge, our yearling gelding was given a 3rd premie. We were very proud of our girls and guy!! Anky says about Navarre " I have never seen a Friesian with such a beautiful canter!!!!" 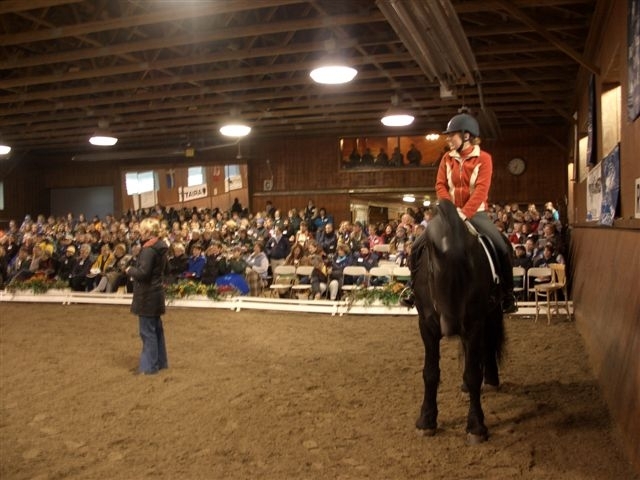 Anky van Grunsven, 2 time Olympic Gold Medalist in Dressage at the 2000 and 2004 games and 6 time World Cup Champion gave a 3 day clinic at the Johnson & Wales University Equine Center in Rehobath, MA on Nov. 5,6 and 7th. 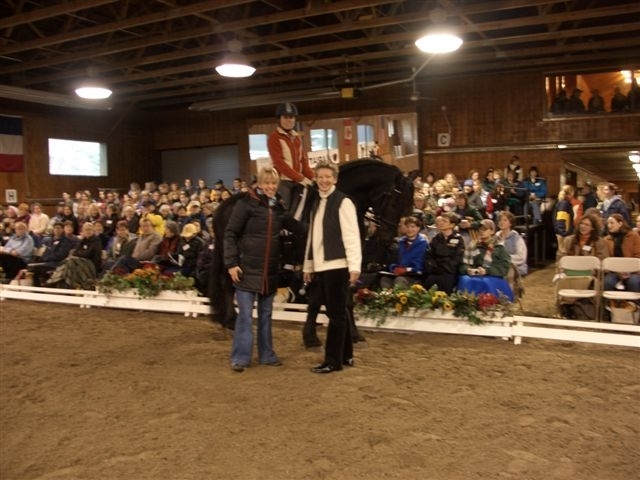 The event was hosted by the New England Dressage Association. Eleven participants were selected on the basis of a submitted video tape and a written biography of horse and rider. The levels went from Training to Grand Prix. Our stallion, Navarre, was chosen for Training level with his rider ,Tara Celentano. It was a wonderful experience. Anky is a good instructor and helped the riders with their specific problems.After the 3rd lesson, all horse/rider teams were much improved. 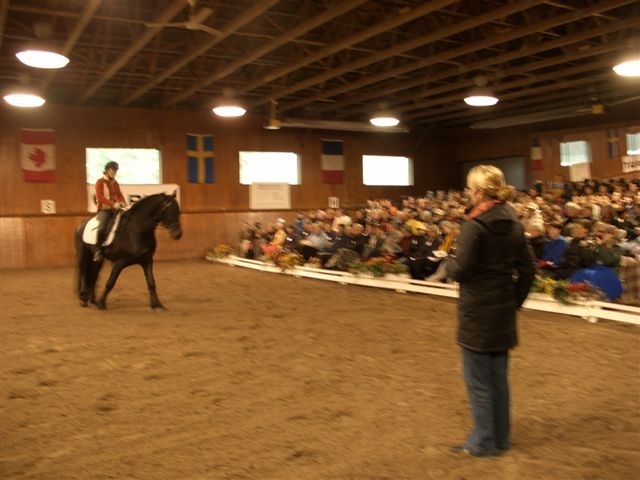 There were over 350 auditors and at the end of the clinic, Anky received a standing ovation and much applause. One of the highlights of the clinic for myself and Lady Hawk Farm were her comments about Navarre's canter. She also stated "it was too bad that he was in America and not Holland!!!" That meant a lot coming from Anky because of her international reputation AND because she is from Holland which is the original home of the Friesian and still has the largest number of Friesians.